In this blog, we walk through the process of working with existing geometry and adding the ever-important part of threads to it. By this I mean physical threads, not virtual threads or visualizations of idealized threads. 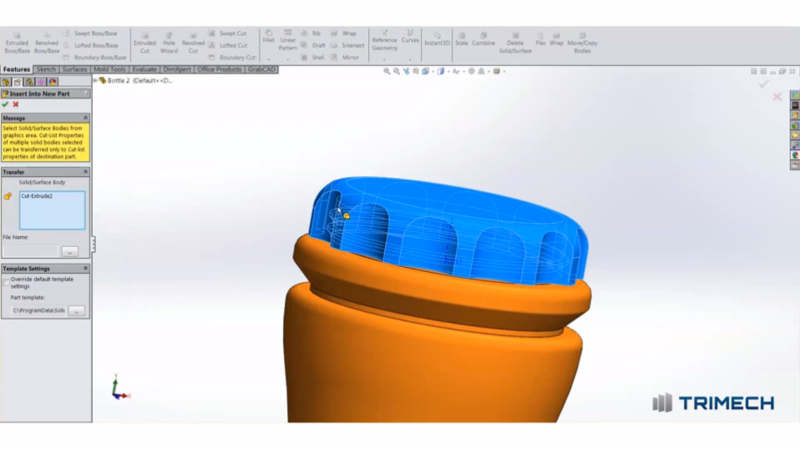 We are talking about the real deal, physical threads modeled in your SOLIDWORKS part. Read on to find out how it's done. It begins with a STEP file. STEP files are extremely useful for sharing parts with anyone outside your organization because it contains the solid geometry of your model, but not the entire feature history of it. That can also present a challenge because there’s no easy way to see how the model was created. Are the threads a standard type or are they just arbitrary? If this part were to be machined that would be a problem. Luckily this is going to be a 3D printed part and I proceed with making the cap. I started by creating a rough outline for the profile of the cap, leaving some clearance at the bottom. The only trick now is to make sure that you uncheck the option for “Merge Results.” By doing this, we are able to create two separate bodies which is the desired effect since an unremovable lid isn’t really a lid. The solid body is what Icall the lid blank. Next, it’s time to create the threads. This is easy with some basic surface modeling techniques using offset surface, fill surface and then cut with surface. These steps are going to remove the inside of the cap so it can be screwed on to the bottle. The offset surface tool is used to quickly create a copy of the existing threads at an offset of 0.3 mm, which is a good amount of clearance for this job. This value adjusts how tight or lose the thread fits. Finally, the fill surface command is used to fill in the on side of the cap, so we can use this shape to remove exactly what we want from the solid or blank of the lid. With that, the lid has been created. You could stop here and print what you have – it will be a functional lid for the bottle. However, if you want to take it a step further you can take the design a step further and add some cut outs and ergonomic features to really take your design to the next level. One area for improvement could be the grip of the cap. Adding some indents is quick and easy. It takes just one arc on the bottom flat face of the lid to create indents all around the cap. I used the 3-point arc tool because it is easy to snap to the existing geometry but you can create any other shape you’d like. 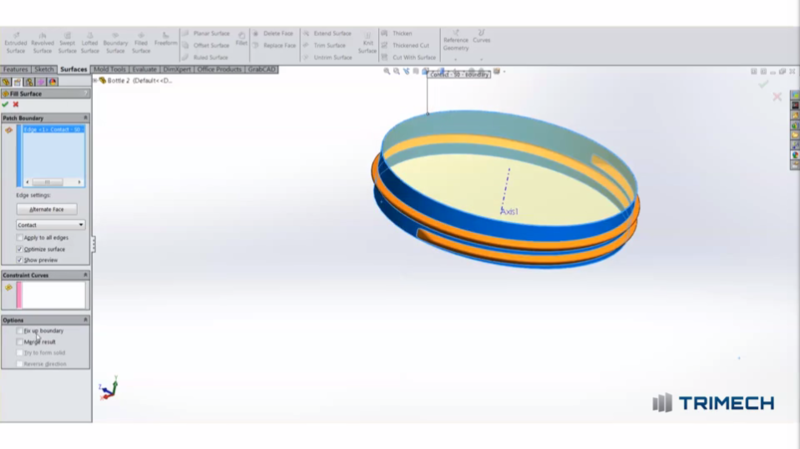 This outline will then be patterned around the lid with the “circular sketch pattern.” SOLIDWORKS will take that initial “seed” shape and pattern it around the lid, just find a number of instances that works for you. Then simply take this sketch and extrude a cut feature through the depth of the lid to add some ergonomic grip to your lid. Now you have a part file with two bodies – one for the lid and one for the bottle. This is known as a multi-body part. As you can see it is very easy to apply this technique to create new parts referencing existing parts. 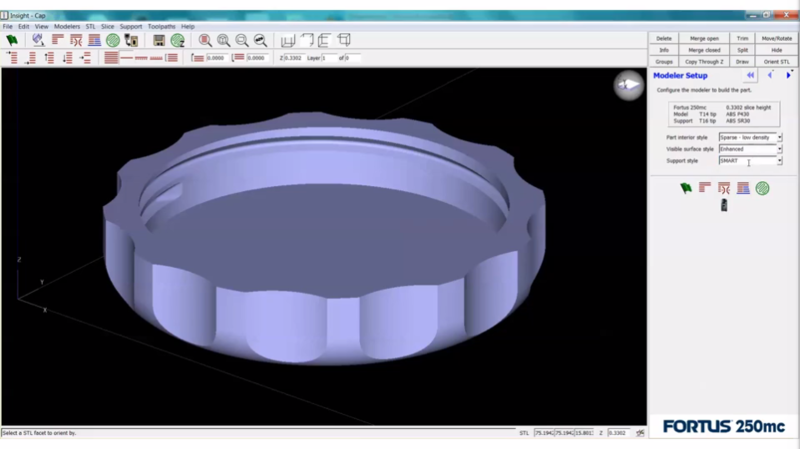 To take the lid and turn it into its own SOLIDWORKS part file use the “Insert Into New Part” option. Now that the geometry has been created, it’s time to make the virtual part a reality by printing it using a 3D printer. In this example, I will be using a Fortus 250mc. It’s a great option to print parts you can use to test for form, fit, and function. You’ll want to always think about the best orientation of your print. This makes it cheaper by using the least amount of materials, but it also can have time and structural implications too. But not just orientation. Make sure you’re printing with the best settings for the job. Think about things like the print resolution, slice height and print density. As with everything in SOLIDWORKS there is more than one way to get the job done. In the spirit of that, I wanted to share another way to create threaded geometry for us to ultimately 3D print. This time it’s not a bottle and cap but rather a mold which will create injected molded plastic parts. In this example, I begin by going directly to one of the best online resources, McMasterCarr to find the right screw size component. If you’ve never used McMasterCarr, I highly recommend you take a look at since it’s the biggest online database of parts, many of which have downloadable 3D model files. Whenever you can find an existing model, you’re going to save a ton of time. From here we choose the right piece of hardware and then even drill down to make sure it’s the right size. To add it to the assembly we will use the “Insert Part” feature. 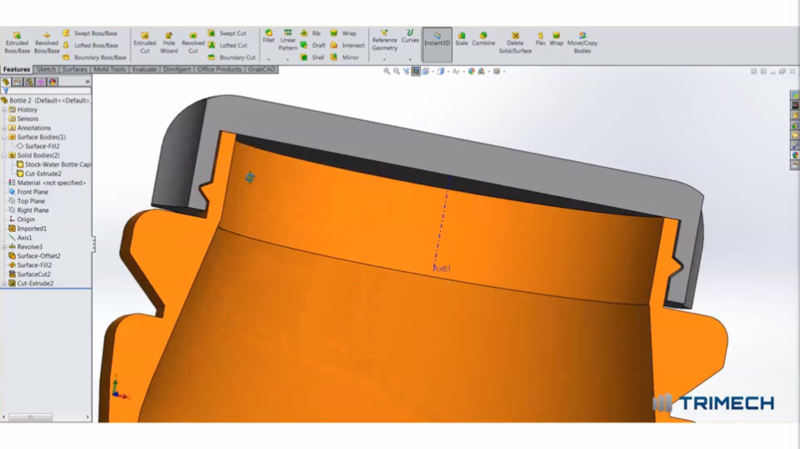 This will bring the component into the current part file as a separate solid body. And now it’s a piece of cake to complete the assembly. With the move copy bodies command you can locate the component quickly and easily. And those are two ways you can work with threads in SOLIDWORKS. Looking to learn more about SOLIDWORKS Sweeps and Threads? Download our infographic!